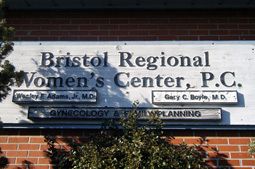 We are a private gynecology office located in Bristol, Tennessee. We serve the Tri-Cities, Northeast Tennessee, Knoxville TN, Southwest Virginia, Northwest North Carolina, Southeast Kentucky, and Southern West Virginia, with abortion and routine gynecological services to women of all ages. Our doctors have been serving these areas for over 30 years. We hope this site will help you become better acquainted with our office and lead you to choose us for your health care needs. Our center offers surgical abortions for women whose pregnancy age is from 6 weeks 3 days up to 14 weeks, as well as medical abortions for women whose pregnancy is 56 days or less from the first day of their last menstrual period. Pregnancy age will be verified by ultrasound and doctor's exam to confirm eligibility for either abortion option. We provide our services in a private physician's office atmosphere with one-on-one patient education. Our center also provides most types of gynecological services including, but not limited to, family planning, sterilization, cancer screening & treatment, infectious diseases, menstruation, sexuality, abnormal uterine bleeding, pelvic pain, perimenopause, and menopause.